Make sure your barbeque grill is a safe distance from your property. We’ve seen too many units damaged by the effects of the barbeque’s heat. And, after you’re finished with your outdoor eating, clean everything up so the area doesn’t become attractive for the wildlife around. 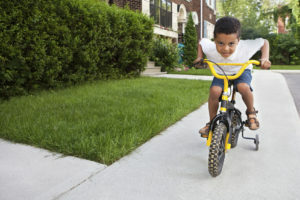 As you drive through your community, keep your eyes open for children playing in the streets, balls rolling in front of your car and bicyclists enjoying a ride. And, always remember to be aware of early-morning or after sunset runners. Make sure you understand plant life around your property, and whether it’s safe for animals and humans. You remember the poison Ivy rule, “If there are leaves of three, let them be.” If you believe you see Poison Ivy, it’s best to notify your property manager. He or she will have the landscapers take care of it. And, just in case, have some hydro-cordizone cream on hand to handle the itch and rash. While you’re protecting yourself with sunscreen and bug repellent, let’s not forget your four-legged companions. Dogs with light noses should have sunscreen applied to their snouts too! And make sure they’re hydrated more than you are. If you let your dog in the water, make sure you dry him well, as some are prone to “hot spots,” or skin irritation and infections from moisture. Recently we were just in our own backyard, and found a tick on our dog, so you don’t have to be in the State Park to bring home an unwanted friend. Check yourself and your animals for ticks each day, and it’s always good to protect yourself with repellent. If your community has a pool, please abide by the pool rules, never leave children unattended, and never swim when the pool is closed or without lifeguards. Make sure those in your family that can’t swim are protected with life vests or other certified flotation devices. So whatever it is you love to do in your community this summer, have a safe and fun time! Posted July 2, 2016 & filed under Property Management Insights.